Once your prescription has been determined, our friendly, professional and highly-experienced team will be at your service to help you choose the frames that will suit your appearance, your vision needs and your budget. Don't despair! Bring them into us, we will fix them wherever possible or you can use our emergency 24-hour turnaround service for new glasses*. Glasses brought in at 9.30, can sometimes be back by 4pm or the following day. Your eyetest will be carried out by one of our friendly professional optometrists. They will take time attending to your personal needs, checking your vision, your eye health and other detectable health issues. 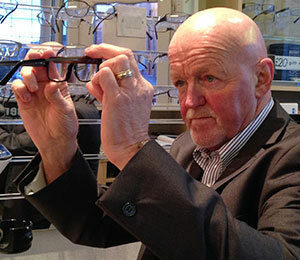 David Bennett, an experienced local time served Ophthalmic technician and experienced dispenser is managing Director of the opticians on Poulton Road, serving the people of Fleetwood and the Flyde Coast area.